On Monday, April 24, 2006, a group of members of the Rotary Club Gardemoen came to the psychiatric hospital for children in Oparany. During their visit last year, they promised the come back and build a real Norwegian gapahuk for the children in the zoo farm. What exactly is gapahuk? It is a wooden cabin, open from one side that shelters its inhabitants from bad weather. The roof is covered with turf that isolates not only from cold, but from rain as well. Its platform is in the shape of a half-circle and in the centre in the „atrium“ there is a fireplace that is hidden from the wind. Due to the rough conditions that are in Norway, especially in winter, the shape and function of the gapahuk has been tested by generations of people who have to live in the nature. So, the friends from Gardemoen came to fulfil their promise. The begun on Monday and on Wednesday, April 26, the cabin will be finished already. In the afternoon, Mrs. Bela came to Oparany to take part in the opening ceremony. The most important will be the opinions of the children of Oparany, of course. They will grill sausages on the fireplace, so its function will be tested immediately. Gapahuk was really finished on April 26, 2006. 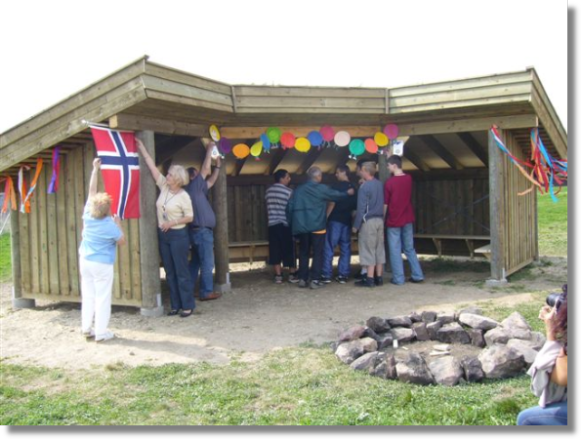 The Norwegian friends were working for three days and handed over their work on April 26, 2006. The hospital accepted the present from the Norwegian Rotary Club Gardemoen in a very festive way. The Czech flag decorated Gapahuk, there were also the flag of the Rotary Club Gardemoen and the symbol of the movement. The colourful centipede from the elementary school in Damníkov on gapahuk was very nice. Mrs. Bìla came to the opening as well and she was very impressed. The children from the hospital were very happy and tried to help too. The technical staff of the hospital came to help a well. All the people who were present appreciated the enthusiasm, modesty and diligence of the friends from Norway. There were also guests from the elementary school in the hospital in Opaøany and the elementary school and kindergarten of Opaøany city. The Norwegian friends came to have a look at the hospital and thanked for being able to work here and give the present to the hospital. Again and again they were thanking for the services offered, for a friendly co-operation during the building and they are looking forward to next year, when they would like to extend their work.